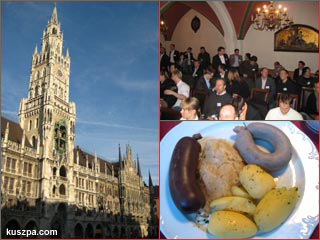 Neues Rathaus Munich, MoMo guests and Bavarian food. On this Mobile Monday in the ‚Neues Rathaus‚ at the Marienplatz in Munich I looked forward to the celebration of the 5th Anniversary of gofresh. So I even brought a nice bottle of champagne for the team of my favorite combatants and had the chance to clink glasses with the whole management team of itsmy.com; Vince Staybl, Sabine Irrgang, Jukka Saarelainen and Mikko Saarelainen. And we also celebrated today’s hot industry news ‚MocoSpace Raises $4 Million B Round‚. Congratulations Justin Siegel and Jamie Hall! Unfortunately I had to leave the party early, so we couldn’t celebrate all night long. Furthermore it was great to see some other ‚old‘ business contacts like e.g. Ralph Suda (Contnet), Daniel Melter (M-Squad), Harald Müller (scopas medien) and Mark Wächter (MWC). ← Zurück Vorheriger Beitrag: Is it a Micky Mouse or Matylda? and if it´s true..in germay ..you are always in celebrations…..
anyway..i hope it was a good lunch…!